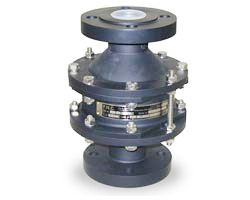 Flame Arrester in-lineThe in-line flame arrester is fitted with two body connectors, one on each side of the flame arrester housing element, preventing flame transmission when flammable gas/air mixtures are present.The intended function is to allow flow but prevent the transmission of a flame.The Bi-directional design prevents flame transmission from both sides. 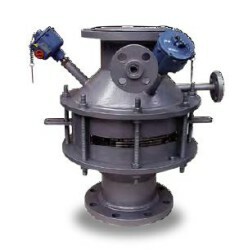 The arrester elements are madeof corrugated strips coiled into the circular element housing.The number of flame element discs depends on the design as well as the explosion group.Tested and certified to EN12874 in accordance with ATEX directive 94/9/EC approved by independent third party approval agencies. 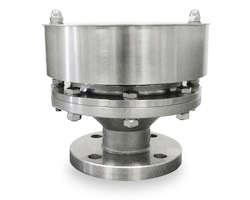 A detonation flame arrester is used in all cases where sufficient "run-up" distance exists for a detonation to develop, depending on the length of piping and pipe configuration on the unprotected side of the arrester and the restrictionon the protected side of the arrester. The number of elements depends on the design as well as explosion group. The elements are made of corrugated strips coiled into circular element housing. Tested and certified to EN12874 in accordance with ATEX directive 94/9/EC approved by independent third party approval agencies.